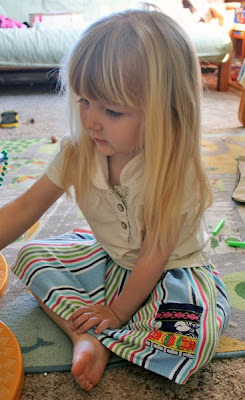 I saw a post on Dollar Store Crafts about how to make a skirt for your littlies out of a tea towel. The tutorial is from Grace Violet. The dollar store near our house had some cute tea towels that were 100% cotton and really soft, so I picked up two that were the same design but different colours (my kids aren't fond of identical clothing, but like wearing stuff that's similar if that makes any sense) and then sat down yesterday evening to hand sew them whilst watching a movie. I didn't cut down the sides like in the tutorial for the smaller skirt, because my kids are 3 and 4. 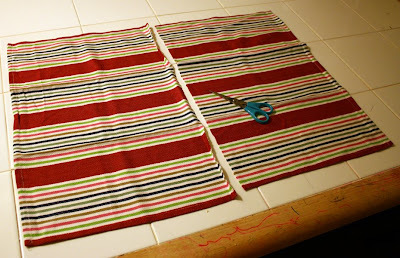 Just cut the tea towel in half, then sew the two pieces together into a big cylinder and sew over the raw edge at the top so that you can thread elastic through. Easy peasy. They turned out soooo cute! I love the pockets - they really make the skirts! I would like to post a picture of these at Dollar Store Crafts if you don't mind! Sure thing Heather. I love the Dollar Store Craft concept! Outstanding idea who would of thought of such a great idea. 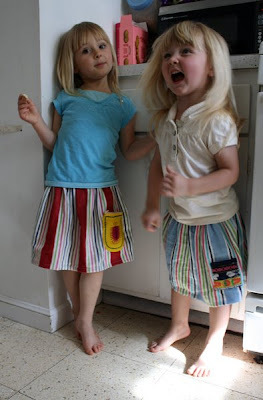 Those are adorable (the skirts and the girls!). 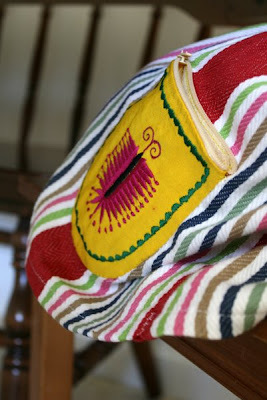 I am so afraid of sewing, but that looks so great! I just found this site today. Lovely skirts. Can someone help me finish off a pair of shorts for my son. I cut them off at the worn knees but I want a finish look because the rest of the jeans are still nice in the seat area, etc. Please and thank you. 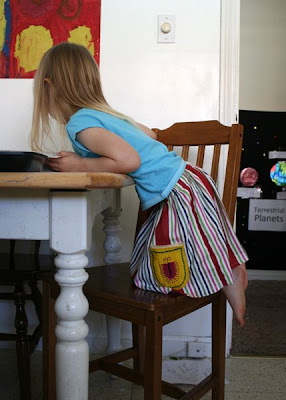 These tea towel skirts are so beautiful.......really ..it's so creative. These are really cute, and I can't wait to make a few for my little girl. Your girls are absolutely adorable!